Spanish rolling stock manufacturer CAF has announced that it is to start building trains at a new factory in South Wales, an important boost to UK manufacturing and the Welsh economy. CAF (Construcciones y Auxiliar de Ferrocarriles) plans to create 300 jobs at the factory near Newport, where it will build trains and trams for the UK network. The company has previously supplied trains to the UK from its factories in Spain. The new facility will be over 46,000 square metres in size, and will employ 200 people when it opens in autumn 2018, rising to 300 by 2019. It is being designed so that CAF can build a range of different trains, including diesel multiple units (DMUs), electric multiple units (EMUs), trams and high-speed trains. Welcoming the news, the First Minister of Wales, Carwyn Jones, said: “Today’s announcement is a major coup for Wales and a big vote of confidence in Wales’ manufacturing industry. We are, once again, competing and beating others on the world stage to secure significant investment to Wales. CAF, which this year celebrates its centenary, has been targeting the UK rail sector in recent years. 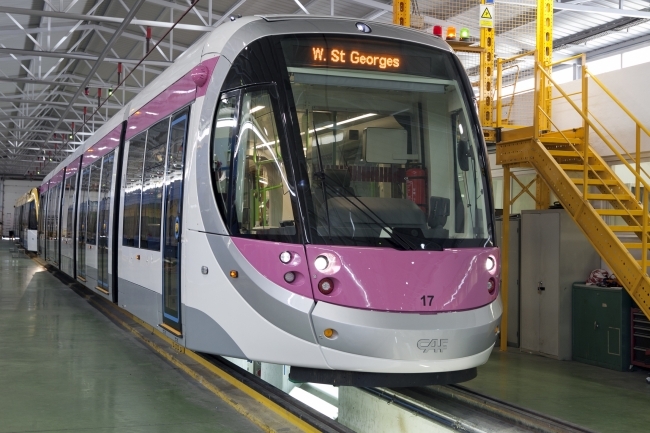 It supplied the trams for Edinburgh’s tram system and the Midland Metro, and currently has contracts to build some 300 trains and coaches for the UK market. These include 31 three-car and 12 four-car EMUs, and 25 two-car and 30 three-car DMUs for the next Northern franchise; 12 five-car EMUs and 66 coaches for TransPennine Express; and 75 coaches for the Caledonian Sleeper service. CAF looked at more than 100 locations throughout the UK before choosing Celtic Business Park, a 100-acre industrial development on the site of the Llanwern steelworks. The location was chosen because of its links to roads, rail and ports, as well as the availability of local people with engineering skills. CAF is investing £30 million to get the factory up and running, and has also received significant grant support from the Welsh Government’s Inward Investment Programme. The new factory is an integral part of CAF’s strategy to win more contracts to supply rolling stock to UK operators. The company is targeting projects with Transport for London, including London Underground and the Docklands Light Railway, as well as High Speed 2 and the Wales and Borders, West Midlands and South Eastern franchises. CAF plans to start recruiting people to work at the factory next spring, and will be offering training and apprenticeship schemes from Autumn 2018. Job opportunities include skilled technicians and engineers, management and support staff. The new factory will also boost the wider UK rail industry supply chain as CAF plans to develops a “cluster” of local and national companies to supply components for its trains.